For those who struggle with alcohol and drug addiction, the road to recovery can be challenging. It is a constant uphill battle to win back your physical and emotional freedom. If that is all too familiar to you, you are not alone. A staggering amount of Americans face drug addiction and alcohol abuse each year. As of 2015 about 40 million Americans had significant addiction issues, according to a study completed by Columbia University. Find an addiction counselor or the treatment center that can provide the right program for your situation. Consider contacting a drug abuse counselor, ministry, transitional housing program, or rehabilitation facility. Depending on the amount of the substances you have consumed, you may need to complete a detox to clear your system before beginning a treatment program. If your situation is severe, you may also need to seek additional medical attention. Rehabilitation programs around the country offer help that apply to a broad spectrum of addiction related issues and can help guide you toward the recovery method that best applies to you. Where are your weaknesses? Does your stress level, busy schedule, or social situation influence your substance use? Make an honest list of triggers and do your best to avoid these things. You can also get rid of the phone numbers, email addresses, or social media profiles of those who negatively influence your addictions, and replace them with contacts that will help you become healthy. Communicate your lifestyle changes to your family and friends so that they can also participate and help support you during your recovery. You might also want to consider physically distancing yourself from negative influences and relationships. Making a fresh start in a new town or city can help you to truly feel like you’ve hit the restart button so that you can begin your sober life with a clean slate and freedom from addiction. Ask someone you trust to become your accountability partner. They will be responsible for checking in with your progress throughout your recovery. This can be someone who you are close to, like a family member, or can be a professional counselor. Be open with them about your struggles and meet with them regularly to review anything that could help or harm your improvement. Keep in mind that they are there to help you, so even if you don’t like what they have to say, try to keep the relationship focused and healthily geared toward your success. Choose healthy habits that can replace the unhealthy ones. If you struggle with alcohol and someone invites you to have a drink, ask them to go out for coffee instead. If you have a drug addiction, try chewing gum when you are tempted to use it. Each time you think of purchasing drugs or alcohol, consider giving that amount of money away to a charity or buy a gift for a friend. Create new daily habits that don’t leave time for your addictions. You have one life to live, and it shouldn’t be weighed down by the burden of addiction. Enjoy a breath of fresh air and live all of your days to the fullest. 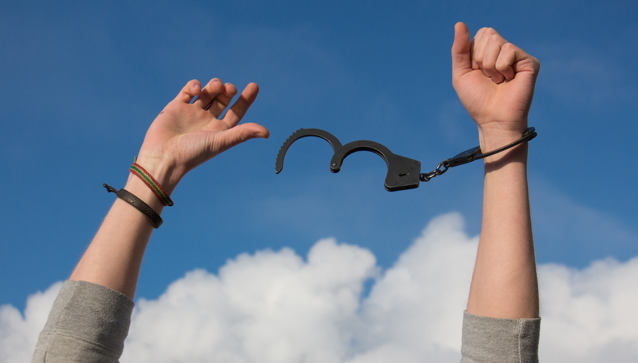 Break free from addiction.